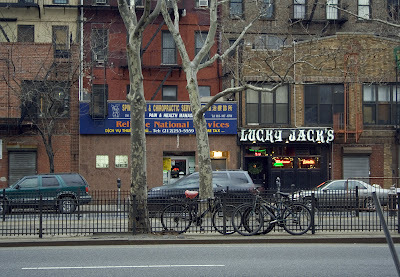 Across the street is Lucky Jack's, an old hole in the wall bar, been around since the 40's, but they recently had their sign redone. NO, I'm lying, it has actually been around only since 2004, and far from being a hole in the wall, it's a hole through the wall, a block long, with another entrance on Orchard Street. It has a long, long copper topped bar and it seems to be a mostly guy place with plenty of flat screened TVs. Here's a review.